Everything I Need To Know About Leadership I’ve Learned From My Dog—The Next Lesson! I had another epiphany about leadership while working my dog on sheep the other day. 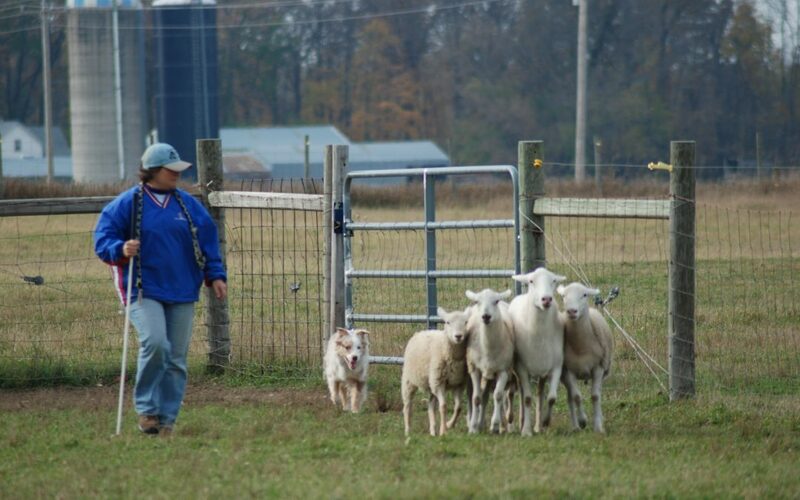 One of the foundations of training a great sheep dog is understanding the concept of “Pressure and Release”. This concept is fundamental to how you can influence your dog and how your dog influences the livestock. Without using Pressure and Release, you run the risk of the livestock going where IT wants to (often a nice big bale of hay in a protected corner of a field) or where the dog wants them to go (running across the field so they can chase them or holding them tightly in a corner). The thing is, I am not directly working the livestock, my dog is. However, I am making the decisions about where I want the stock to go and how I want my dog to do that. Sounds a lot like leadership to me! Get it? So here is how Pressure and Release works. When I want my dog to move away from me, I use a stock stick to “move” the dog from a distance. It’s like an extension of my hand and the dog should move away from my “pressure”. Or, if my dog isn’t listening to my commands, I walk toward them—in an attempt to control her, giving the message that “Hey, listen to me”. The key is that when the dog STARTS to do what I want, I must release the pressure. I have to “let go” so that the dog uses its own skills and instincts to move the stock. I can always “re-apply” pressure if they are going astray but I must trust them to do the right thing, according to the training they’ve had. In leadership, there are lots of types of pressure we put on employees, some gentle or encouraging and some, downright directive. Pressure can be as simple as giving positive feedback for a job well done, asking for their perspectives, posing challenging questions, establishing the vision, overseeing the strategy, explaining the “outcome” you seek of a project they will lead, giving corrective feedback, or stepping in during a meeting or client presentation if it isn’t going well. That is, the “pressure” is any influence we have on an employee. The fact is, different actions by leaders create different levels of pressure, some predictable and some surprising to us. Sometimes, we are not even intending to create pressure but boy, do our employees feel it. Sometimes, we are indirectly applying pressure, hoping they won’t notice what we are doing but hoping they get the hint. But all too often they see if for what it is. Pressure (in both stock and leadership) is necessary, when applied appropriately and purposely. However, pressure also creates stress. Too little pressure from me may mean the dogs and/or livestock do their own thing, not because they’re trying to mess up, but because they are given the autonomy to choose. Too much pressure causes my dog to move too quickly and/or too much pressure from my dog to the livestock causes them to run amok! In leadership, pressure misapplied or applied without intention often leads our people to make poor choices. Yes, they make the choices on their own, we don’t CAUSE those choices. But our pressure (whether too much or too little) allows employees to do nothing, go down a path that ends up wasting time and effort, or even make poor judgments. In humans, pressure from leaders evoke emotions. Positive pressure provides direction, support, guidance. Negative pressure will almost always trigger one’s “emotional brain” which means less oxygen goes to the Executive Center of the brain. And, when that happens, poor judgments are neurologically prone to occur. I have often seen leaders apply too much or too little pressure. Or, after they apply the pressure, they don’t “take it off” and make situations unintentionally worse by continuing to trigger emotional fight or flight responses in others. As a leader, you need to be aware of what kind of pressure you are putting on employees. Especially if you are unconsciously or unwittingly putting negative pressure on someone in the wrong amount or wrong time. It may make you feel better to go into “control” mode but it may not be good for those who work for you. After years of experience, in coaching, in leadership (and working dogs) I have learned a lot about the conscious and appropriate use of pressure AND release. I’d love to talk to you about you have learned. Give me a call or send me an email.